Law Courses From IGNOU 2019: With a high demand of Law courses in India it has become very important for distance & open learning universities to run law courses. 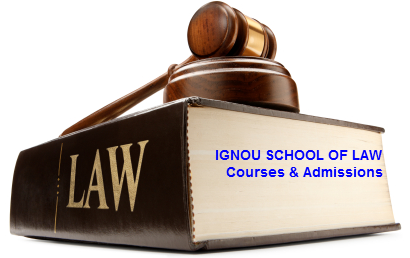 IGNOU offers Law courses through distance & open learning through its IGNOU School of Law. IGNOU School of Law (SOL) was established in the year 2005. The objective behind setting up the law school at IGNOU was to promote legal education through distance & open learning mode. Through its Law School, IGNOU is spreading awareness about legal rights and responsibilities in this rapidly changing world. Lots of students each year enroll into various distance learning Law courses at IGNOU. In the year 1994 Prof Menon’s Committee suggested developing professional programmes in Law including programmes in Paralegal Education, Court Administration, Law and Office Management, Legal Aid administration, occupation based and management oriented legal education for middle and top-level personnel in government and industry. Prof Menon’s Committee was set up by IGNOU to meet the demand of legal education in India through distance learning. IGNOU also setup a virtual learning platform in the year 2008 to offer online courses in Law. As of now IGNOU is offering a PG Certificate in Cyber Law online. Using the platform end to end facility is being offered to students. Right from applying for admission online to counseling, fee payment, assignment and end term exam can be facilitated through the virtual platform. As of now IGNOU School of Law is offering the following courses in Law. The courses include certificate programs, PG Diploma courses, Diploma courses and research program. For most of the courses there is no age bar for admission. IGNOU generally invite applications for admission twice in a year. But some of the courses e.g PG Certificate in Cyber Law admissions are open through out the year. You can keep an eye on IGNOU official website or on popular news papers about the admission notification for law courses at IGNOU. You can also subscribe to our blog for any such information using the subscription box available on right sidebar. For more information about the Law Courses from IGNOU School Of Law, you can contact on the following details.